Provides a useful one-stop resource for understanding the most valuable aspects of ceramics in nuclear applications. 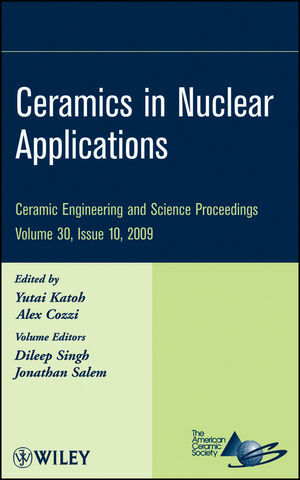 Yutai Katoh and Alex Cozzi are the authors of Ceramics in Nuclear Applications, Volume 30, Issue 10, published by Wiley. Silicon Carbide and Carbon Composites. Single- and Multi- Layered Interphases in SiC/SiC Composites Exposed to Severe Conditions: An Overview (Roger Naslain, Rene Pailer, and Jacques Lamon). (Research and Developments on C/C Composite for Very High Temperature Reactor (VHTR) Application (Taiju Shibata, Junya Sumita, Taiyo Makita, Takashi Takagi, Eiki Kunimoto, and Kazuhiro Sawa). (X-Ray Tomographic Characterization of the Macroscopic Porosity of VCI SiC/SiC Composites-Effects on the Elastic Behavior (L. Gelebart, C. Chateau, M. Bornert, J Crepin, and E. Boller). (Mechanical Strength of CTP Triplex SiC Fuel Clad Tubes after Irradiation in MIT Research Reactor under PWR Collant Conditions (Herbert Feinroth, Matthew Ales, Eric Barringer, Gordon Kohse, David Carpenter, and Roger Jaramillo). Behaviors of SiC Fibers at High Temperature (C. Colin, V. Fajanga, and L. Gelebart). Fracture Resitance of Silicon Carbide Composites Using Various Nothced Specimens (Takashi Nozawa, Hiroyasu Tanigawa, Joon-Soo Park, and Akira Kohyama). Optimization of an Interphase Thickness in Hot-Pressed SiC/SiC Composites (Weon-Ju Kim, John Hoon Lee, Dang-Hyok Yoon, and Ji Yeon Park). Validation of Ring-on Ring Flexural Test for Nuclear Ceramics Using Miniaturized Specimens (S.Kondo, Y. Katoh, J.W. Kim and L.L. Snead). Design. Fabrication, and Testing of Silicon Infiltrated Ceramic Plate-Type Heat Exchangers (J. Schmidt, M. Scheiffele, M. Crippa, P.F. Peterson, K. Sridharan, Y. Chen, L.C. Olson, M.H. Anderson and T.R. Allen). Microstructural Studies of Hot PRessed Silicon Carbide Ceramic (Abhikit Ghosh, Abdul K. Gulnar, Ram K. Fotedar, Goutam K. Dey, and Ashok K. Suri). Diffusion Bonding of Silicon Carbide to Ferritic Steel (Zhihong Zhong, Tatsuya Hinoki, and Akira Kohyama). Fracture Properties of SiC Layer in TRISO-Coated Fuel Particles (Thak Sang Byun, Jun Weon Kim, John D. Hunn, Jim H. Miller, and Lance L. Snead). Optimization of Fracture Strength Tests for the SiC Layer of Coated Fuel Particles by Finite Element Analysis (Jin Weon Kim, Thak Sang Byun, and Yutai Katoh). Laser Melting of Spark Plasma Sintered Zirconium Carbide: Thermophysical Properties of a Generation IV Very High Temperature Reactor Material (Heather F. Jackson, Doni J. Daniel, William J. Clegg, Mike J. Reece, Fawad Inam, Dario Manara, Carlo Perinetti Casoni, Franck De Bruycker, Konstantinos Boboridis, and William E. Lee). 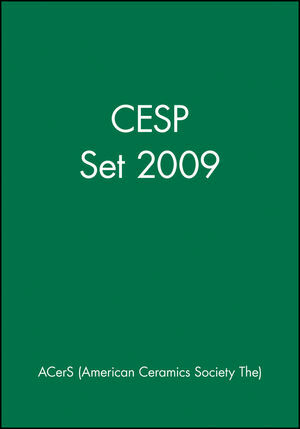 Development and Testing of a Cement Waste Form for TRU Effluent from the Savannah River Site Mixed Oxide Fuel Fabrication Facility (A.D. Cozzi and E.K. Hansen). Frit Optimization for Sludge Batch Processing at the Defense Waste Processing Facility (Kevin M. Fox, David. K. Peeler, and Thomas B. Edwards). Ceramic COated Particles for Safe Operation in HTRs and in Long-Term Storage (Heinz Nabielik, Hanno can der Merwe, Johannes Fachinger, Karl Verfondem, Werner von Lensa, Bernd Grambow, and Eva de Visser Tynova).